The hunt for the elusive dark matter received yet another blow earlier today at an international conference in Sheffield, England. Scientists with the Large Underground Xenon (LUX) dark matter experiment announced that they found no hints of dark matter particles in their latest analysis, despite increasing the sensitivity of the experiment fourfold for its final run. Stupid dark matter. At least these results have resolved most of the troubling discrepancies between various dark matter experiments over the last several years. The planets, stars, galaxies, and everything else that we see makes up just 4.9 percent of the stuff in the universe. Roughly 26.8 percent is dark matter. (The rest — 68.3 percent — is made up of dark energy.) We’re not exactly sure what it is, but physicists can tell it’s there because of its indirect effects, like the famous “bullet cluster” composite image that made headlines several years ago. Physicists have been searching for years to directly detect dark matter particles, using instruments in the sky and deep underground. This composite image of the so-called “Bullet Cluster” is strong evidence for the existence of dark matter. (Image: X-ray: NASA/CXC/CfA/ M.Markevitch et al. ; Lensing Map: NASA/STScI; ESO WFI; Magellan/U.Arizona/; D.Clowe et al. ; Optical: NASA/STScI; Magellan/U.Arizona/D.Clowe et al. These kinds of experiments are usually housed deep underground — the better to block out cosmic rays, which can easily be confused with a dark matter signal — and feature a detector housing a carefully chosen target material, such as germanium or silicon crystals, or liquid xenon. [LUX uses xenon.] Then physicists wait for a rare collision between an incoming dark matter particle and the nucleus of an atom in the target material. This should give rise to a tiny flash of light, and if that flash is strong enough, it will be recorded by the detector. [I]n order to be detected, the dark matter particle must transfer enough energy when it knocks the nucleus for the resulting signal to go above the detector’s energy threshold. A lighter WIMP would be much more difficult to detect, which is why physicists originally favored models that predicted a heavier WIMP. “Kinematically, it’s much easier for a heavier particle to transmit that energy than a lighter particle,” New York University physicist Neal Weiner told me at the time, comparing the two scenarios to bowling balls and ping-pong balls. As experiment after experiment has failed to detect a dark matter particle, the light WIMP scenario has started looking more likely—assuming it’s even a WIMP at all and not some other more exotic possibility. There have been tantalizing hints now and then, but none met the threshold required to claim a bona fide discovery. 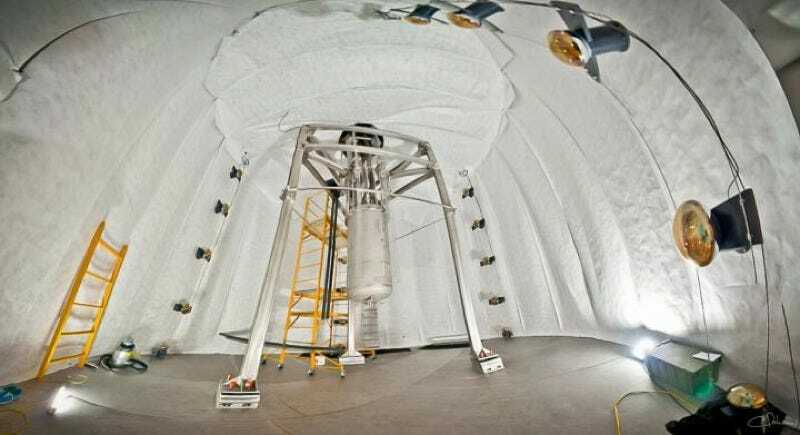 Most controversial is the DAMA/LIBRA experiment (Dark Matter/Large Sodium Iodide Bulk for Rare Processes), located deep underground in the Gran Sasso mountain in central Italy. Over a decade ago, that collaboration claimed to detect tiny fluctuations in the rate of collision events over the course of a year. But others doubted it was a dark matter signal, especially since the similar XENON10 Cryogenic Dark Matter Search II (CDMSII) experiments failed to detect any signal in that energy range. The LUX collaboration didn’t have much earlier success either, but physicists were hoping their luck would change during this final run, especially given the huge upgrades in the experiment’s sensitivity. In particular, they hoped to confirm recent hints of a dark matter signal in data collected by the Fermi space telescope. Alas, LUX physicists saw nothing when they analyzed the data from that final run. “It would have been marvelous if the improved sensitivity had also delivered a clear dark matter signal,” Gaitskell admitted in a statement. On the plus side, these latest results from LUX definitively showed that prior hints of possible WIMPs were false. “Those experiments with possible positive signals have also now clarified their position,” Gaitskell told Gizmodo. “They no longer assert they have evidence for WIMP events.” The notable exception is the stubborn folks at the DAMA/LIBRA collaboration, who still insist their signal is real. The rest of the community remains unconvinced. “It would have to be a very exotic dark matter particle to avoid detection in our experiment and yet appear in theirs,” said Gaitskell. The successor to LUX, known as LUX-ZEPLIN (or LZ), will have a bigger target made of much purer xenon, increasing the chances of a direct collision with a dark matter particle. Will there ever come a day when dark matter hunters throw up their hands and declare defeat on the WIMPs scenario? It’s a possibility constantly under consideration, according to Gaitskell, although WIMPs are still the favored candidate. The University of Chicago’s Juan Collar is more pessimistic, particularly if the upgraded XENON-1T experiment also finds nothing. If that happens, “I personally believe there will be a mass migration to look for other dark matter candidates beyond the WIMP,” he told Gizmodo.